DUMBARTON fought the good fight against Irn-Bru Scottish League division one title contenders Partick Thistle at Firhill, but were eventually outgunned. 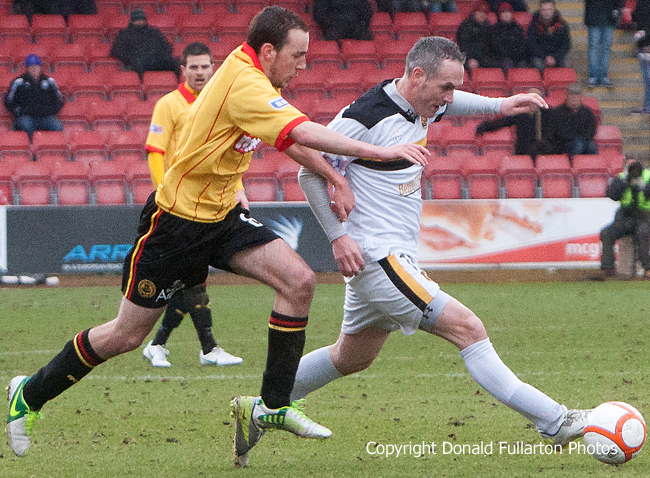 DUMBARTON fought the good fight against Irn-Bru Scottish League division one title contenders Partick Thistle on a bitterly cold day at Firhill, but were eventually outgunned. However the 3-0 winning margin in front of a 2,715 crowd did not reflect a fighting performance by a much-changed Dumbarton side, with trialist Robbie Winters in for Jim Lister and Garry Fleming at no.9. Top scorer Bryan Prunty was an absentee with an ankle injury. The visitors had two great chances in the opening minutes, first when Fleming beat a defender and his shot was pushed on to the post by keeper Scott Fox and then when Mark Gilhaney shot straight at the keeper from close range. But the opener came at the other end after eight minutes when Steve Craig headed to Steve Lawless who netted. The rest of the half was a close contest, with Sons giving as good as they got. After the break the end to end battle continued, and it was not until 16 minutes before the final whistle that Lawless grabbed a second to clinch victory for his side. Sub Kris Doolan added a third just before the end. The picture shows Robbie Winters racing past a defender.